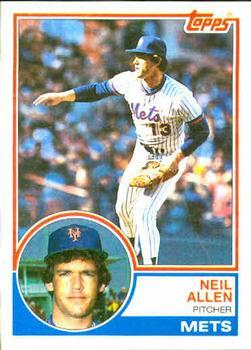 Neil Allen enjoyed three good years as a closer with the New York Mets in the early 1980s. However, over the course of his 11 years in the majors (1979-1989), the righty bounced back and forth between starting and relieving. Yet despite a rocky road professionally and personally, Allen’s native enthusiasm remained intact. That made him well suited for his long second career in baseball – from 1995 on, Allen has been a successful pitching coach. This man has faced adversity at several times in his life, much of it stemming from alcoholism. Each time, he has relied on baseball and his cheerful nature to help him overcome obstacles and continue to make contributions to both the game and his family. When Allen was two years old, his father was diagnosed with retinitis pigmentosa, which left him legally blind. Bob Allen still played a big role in young Neil’s life, especially since Bob’s passion was baseball. As Allen matured, he developed a major asset as an athlete, a powerful right arm for throwing a baseball or football. He attended Bishop Ward High School in Kansas City, where he was a standout quarterback on his high school football team. He originally planned to attend Kansas State University on a football scholarship. But his life changed during the spring of his senior year, 1976. After signing his contract with the Mets, Allen went to Marion in the rookie-level Appalachian League. He appeared in six games for the team, collecting two wins and striking out 29 batters in 33 innings. The Mets then moved him to the Wausau Mets of the Midwest League (Class A). He started six games and finished with a 4-2 record. Allen returned east for the 1977 season. He played for the Lynchburg Mets of the Carolina League (also Class A). He went 10-2 with a 2.79 earned run average and led the Carolina League with 126 strikeouts in 142 innings pitched. That strong performance earned Allen promotion to the Jackson Mets of the Texas League (Class AA) for the 1978 season. Although his record was 5-9 during his year in Jackson, he had 111 strikeouts in 120 innings and a league-leading 2.10 ERA. This was enough to get him promoted to the Mets’ top farm team, the Tidewater Tides, for the last part of the season. Against the higher-caliber competition, Allen struggled. He had only 30 strikeouts in the ten games that he started for Tidewater. His ERA also rose to 4.42 during his time with the Tides. Yet despite his lack of seasoning, the 21-year-old Allen was promoted to the majors as a starting pitcher in 1979. Later that summer, Mets beat writer Jack Lang commented that the franchise’s low budget at the time was a factor. “[General manager Joe] McDonald and the people at the Mets who count pennies shoved Neil Allen, Mike Scott and Jesse Orosco down [manager Joe] Torre’s throat. … They just weren’t ready this year.”9 Allen made his major league debut on April 15 when he started against the Philadelphia Phillies. Allen pitched six innings and had just one strikeout; he took the loss as the Phillies won 6-3. Allen went 0-4 as a starter that season with the Mets. During this difficult stretch, he made a good friend in Herb Norman, the Met’s longtime equipment manager, who comforted the disconsolate Allen at his locker after a couple of poundings. Yet despite Norman’s support, Allen lacked confidence.10 He was on the verge of being sent back to the minor leagues. After moving to the bullpen, Allen went on to win his next four decisions in a row. His first major-league win came on May 20, when he pitched 1 2/3 innings of relief in an 8-7 Mets win over the Phillies. Allen later earned his first of 75 major-league saves when he pitched the final 2 1/3 innings of a 6-4 Mets win over the Cubs on July 28. Other teams coveted Allen, but he remained the Mets closer for the next two years, collecting 18 saves in 1981 and another 19 in 1982. Those totals would have been higher if his lowly team had provided more opportunities, and if Allen hadn’t lost much of 1982 to an intestinal infection and a strained elbow.15 Allen ranked fourth in the National League in saves in 1980, third in 1981, and sixth in 1982. He was a capable reliever in an era dominated by the likes of Hall of Famers Bruce Sutter and Rollie Fingers. The Mets felt strongly enough about his ability to trade away another young relief ace, Jeff Reardon, in May 1981. Allen struggled early in the 1983 season. He lost four games in relief, including two consecutive games in which he gave up walk-off hits against the Phillies, including an “ultimate grand slam” to Bo Díaz on April 13. He lost the closer job to Jesse Orosco. Unfortunately, Allen had developed a drinking problem during this time. When his role lessened, his drinking increased and Allen struggled to stay sober. Some teammates – notably Tom Seaver – didn’t really believe Allen had a problem.16 Eventually doctors at New York’s Smithers Center determined that Allen was suffering from emotional stress, as opposed to alcohol dependency.17 As it developed, however, the latter turned out to be true. Allen said at the time that he hoped the trade would help him improve his performance on the mound. “I think it’s going to help me get things turned around. “I’ve struggled drastically this year, it’s no big secret. Maybe this will help Neil Allen get on the track to be what he once was,” he said.21 That July, he also claimed that he never really had a drinking problem – “What I had was an emotional problem.” It turned out to be denial, but at least for the time being, Allen added, “I think I’ve learned to control myself.”22 Indeed, he went 10-6 for the Cardinals over the rest of the season. He started 18 games for the Cardinals, completing four of them. Despite doing well in the rotation, Allen returned to the bullpen for the Cardinals in 1984. At the end of the exhibition season, Herzog decided that his pitching staff would be better off with a relief tandem of Bruce Sutter and Allen.23 Allen started just once in 57 games that year, finishing 18 as a reliever, collecting three saves, and posting a 3.55 ERA. Sutter, who’d had an off-year in 1983, returned to form, getting 45 saves. Eventually, St. Louis sold his contract to the New York Yankees on July 16. At the time of the trade, he was 1-4 with a 5.59 earned run average. Yankees manager Billy Martin said, “I wanted him, asked for him and think he will be of great help to us in our stretch run. The youngster has a live arm, with a major league fastball and a big-league curve.”26After his arrival in the Bronx, Allen appeared in 17 games and was 1-0 with one save and a 2.76 ERA. On February 13, 1986, Allen was traded to the Chicago White Sox with Scott Bradley and Glen Braxton for Ron Hassey, Matt Winters, Chris Alvarez, and Eric Schmidt. The White Sox made Allen a starting pitcher again that season. He earned his first win of the season against Ron Guidry at Yankee Stadium on May 15. Allen gave up only one earned run, four hits and two walks in seven innings for the first White Sox victory over Guidry in five years. For the season, Allen went 7-2 with a 3.82 ERA in 22 games (17 starts). He credited his success to learning a change-up. Manager Jim Fregosi confirmed it, saying, “Basically, he was a two-pitch pitcher. . . Now he’s finding out how to pitch to spots and change speeds.”27 Unfortunately, he tore a forearm muscle in late July and didn’t return until October. Allen signed with the Yankees again for 1988. He appeared in 41 games that season and finished with a 5-3 record and 3.84 ERA. He had two spot starts that year, but more remarkable by far was a long relief appearance. On May 31, Allen entered the game in the first inning to replace Al Leiter, who threw just one pitch. Oakland’s leadoff man, Carney Lansford, lined a shot off Leiter’s left wrist for a single; Leiter made a throwing error that allowed Lansford to reach second, and then departed.29 Allen retired the first 19 men he faced, gave up just three hits, and did not allow a run for the remainder of the game. Allen was credited with a shutout but not a complete game, since he was not the starter.30 He became the second pitcher to do so after Ernie Shore’s quasi-perfect game in relief of Babe Ruth in 1917. The Indians released Allen on October 4, 1989. In 1990, he got a final chance with the Cincinnati Reds, courtesy of manager Lou Piniella and GM Bob Quinn, who knew him from the Yankees (Quinn also recognized Allen’s struggle to stay sober from personal experience). Around that time, his divorce was at last finalized.33 He pitched in 12 games for the Nashville Sounds, the Reds’ Triple-A farm team, before retiring from pitching. He finished his career with a 58-70 record along with a 3.88 ERA, 611 strikeouts in 988 1/3 innings, and 75 saves in 104 opportunities. Allen began coaching several years after his retirement. His first such job came in 1995 when Butch Hobson, the manager of the independent Mobile Baysharks, called and asked Allen to be the pitching coach. “Making no money, taking long bus rides in the summer heat of the South, but I loved it. Loved working with pitchers and seeing them light up, the enthusiasm, when you gave them something that worked,” was how Allen described the experience.34 The team went 40-59 that year and folded after the season owing to lack of attendance. Allen joined the Toronto Blue Jays organization in 1996. He was the pitching coach of their team in the New York–Penn League (short-season Class A), the St. Catharines Stompers. He coached there in 1996 as well as the 1998-1999 seasons. In between time with the Stompers, Allen spent the 1997 season with the Medicine Hat Blue Jays of the rookie-level Pioneer League. After four seasons in the Jays chain, Allen returned to the Yankees in 2000. That season, he was the pitching coach of the Greensboro Bats in the South Atlantic League. Allen spent the 2001-2002 with the Staten Island Yankees of the New York-Penn League before moving up to the Triple-A Columbus Clippers. Allen remained the pitching coach at Columbus during the 2003 and 2004 seasons. He served as the bullpen coach for the Yankees in 2005 before returning to Columbus in 2006. After a year with the Charlotte Stone Crabs (Class A), Allen spent four years as the pitching coach of the Triple-A Durham Bulls. During his tenure in Durham, Allen coached many of the successful young Rays pitchers, such as Alex Cobb, Chris Archer, and Matt Moore.37 His work with these young pitchers played a big role in their success as well as the Bulls’ success during those years. Allen, who expressed his gratitude to the team for standing by him, continues as the Twins pitching coach as of the 2017 season. This biography was reviewed by Rory Costello, who also provided additional research. 1 Patrick Reusse, “Twins coach Allen is schooled in pitching and in life,” Minneapolis Star Tribune, February 9, 2015. Jane Gross, “Allen Has the Right Stuff,” New York Times, May 3, 1982. 2 “Betty Rae Allen,” Kansas City Star, March 20, 2014. 6 The Mets also selected Terry Sutcliffe in the 32nd round – but Sutcliffe, unlike Allen, chose to go to college. He eventually was drafted again in 1979 by his older brother’s team, the Los Angeles Dodgers, and pitched three years in the minors (1979-81). 9 Jack Lang, “Mets Get Two Vets to Replace Kid Hurlers,” The Sporting News, June 30, 1979: 27. 12 Mark Simon, “Neil Allen was a good Met, too,” ESPN.com, August 20, 2015. 13 Jack Lang, “A Believe-It-or-Not Saga,” The Sporting News, August 2, 1980, 7. 14 Michael Kay, “Sobering Thought for Neil Allen,” New York Daily News, March 18, 1990. 15 Joseph Durso, “Allen’s Arm Passes First Test,” New York Times, March 6, 1983. 16 Malcolm Moran, “Allen’s Big Struggle is Waged Within,” New York Times, May 3, 1983. 17 Gerald Eskenazi, “Allen Afflicted by Stress,” New York Times, May 3, 1983. 18 Murray Chass, “Mets Are Planning More Starts for Allen,” New York Times, May 22, 1983. 19 Larry Liebenthal, Double Blackjack: The Best and Worst Deals Made by the New York Mets in Their Years of Existence (Lincoln, Nebraska: iUniverse, Inc., 2004), 95. 22 Joseph Durso, “Neil Allen In Control Again,” New York Times, July 27, 1983. 23 Rick Hummel, “Allen Joins Sutter in Cards’ Bullpen,” The Sporting News, April 16, 1984, 18. 24 “Allen May Join Yankees,” New York Times, July 16, 1985. 26 “Billy Martin Gets What He Asked for – Neil Allen – in a Trade,” Los Angeles Times, July 18, 1985. 27 Dave van Dyck, “Allen May Have Found a Home,” The Sporting News, August 4, 1986, 25. 28 Liz Smith, “Bruce, Demi shop,” syndicated column, Decatur (Illinois) Herald and Review, October 4, 1987, 31. 29 Michael Martinez, “What a Relief, Allen Goes 9,” New York Times, June 1, 1988. 30 Peter Bjarkman, The New York Mets Encyclopedia (Sports Publishing LLC, 2004), 115. 32 La Velle E. Neal III, “Twins suspend pitching coach Neil Allen after DWI arrest,” Minneapolids Star Tribune, May 27, 2016. 33 Kay, “Sobering Thought for Neil Allen,” Paul Daugherty. “The Mighty Quinn.” Cincinnati, March 1992, 24. 34 Reusse, “Twins coach Allen is schooled in pitching and in life.”. 35 Albert Chen, “The secret of Yankees ace Wang,” Sports Illustrated, April 15, 2008. 36 “A Look at New Durham Pitching Coach Neil Allen,” DRaysBay.com, December 20, 2010. 37 Mark Simon, “Good guy' Allen a smart hire for the Twins,” ESPN.com, November 26, 2014. 38 Reusse, “Twins coach Allen is schooled in pitching and in life.” “Lisa Ann Allen,” Sarasota Herald-Tribune, September 11, 2012. 40 Rhett Bollinger, “Three coaches join new manager Molitor's staff,” MLB.com, November 25, 2014. 42 Phil Miller, “Contrite Neil Allen returns to Twins six weeks after drunken-driving arrest,” Minneapolis Star Tribune, July 8, 2016.